I would say the research was just as easy in 4E, yet there was certainly less concern about adhering to prior canon in that edition. No, I think this represents a change in their thinking, with regards to the setting. That said, it's still not ideal. We didn't need an imported baddie, and the trickle of lore we get now, compared to what we were getting, is simply painful. The insertion of Acererak was less jolting to me once I read the explanation. Frankly, it's kind of a throw back to 2E. Same. He isn't even supposed to be the final boss. It's possible to encounter him, yes, but if you don't like him being there, leaving him out is no issue. I kinda like the throwback to 2e, as well. It makes sense for a planes travelling power like him to have had some influence beyond GH. WotC delivers another hit; very on-brand. I love this book, really well written and evocative in art. I am getting ideas on how to really develop it further. I have to ask, would this be a good book for non-gamers, or is it mainly an adventure module? There are various sidebars throughout with bits of lore, such as those dealing with Ubtao's continued disappearance since the beginning of the Spellplague. Maybe it will help turn you into a (D&D) gamer? Is finding a gaming group that hard in your area? Or in your situation? Trust me. Reading books and lore is a nice hobby. But playing the game is like LIVING inside the lore. It is essentially what role-playing games are about�. it's living a life inside a fantasy world (through the eyes of your Character). Don't just read about the heroes�.. BE one of the heroes. That has always been the lure of FRPGs, and even I knew this 2 decades ago when I was a teen DM. The best way is to find a stable and long-term DM who runs a "long-term" living campaign for a handful of players. This type of campaign does not end after a single "Campaign Book" (e.g. a single campaign like Rage of Demons). Rather, the Player-Characters continue from one adventure campaign after another�. until the real-world Players end up playing in the same Living Campaign for years, and their Characters (the ones that survive countless monster attacks) eventually retire in their gray-haired years, or they max out their powers and become demigods etc. It's like living a second life, one where you (through your Character's eyes) are immersed in the lore of a fantasy world. It's quite an experience. Corellons Devout I'm not sure how to answer you. I'm don't think I'd recommend any game books for nongamers. I will buy the books for lore purposes. For example, I often buy the campaign and player guide books. A bit of both, I guess. I�ve played before, but those groups fell apart (friendship drama). I know there are gaming opportunities, and I have friends who play, but they play in a different circle of friends, if that makes sense. They have their own thing going on. Oh, I know lol. I roleplay via writing/text, and oral storytelling (which is somewhat like LARPing, but not quite as much activity lol). I�m familiar with being �in character�, and having adventures. I don�t read sourcebooks cover to cover, I�ll just read them for info I am interested in, and for any updates in the setting. But if it�s mainly a gaming adventure, it has little use to me, personally. I really like this adventure. The book is really good. Art is superb quality. The hexcrawling and the sandbox style really did it for me. Representing the setting of Chult is also very well done. Good stuff! Interestingly, the MtG guys are working on releasing the next set, Ixalan - a realm with dinosaurs. Coincidence? Also pirates, undead (vamps), goblins, and merfolk. Of course, the undead in ToA are liches, AFAIK. Chult still has its Jungle goblins, right? Just started reading my copy. Overall, ToA looks solid, has lots of great info. Plus the full sized continental-sized Chult Poster Map insert is a huge bonus. Great production values. And yeah, I did look at the Almiraj bunnicorn�. and I thought the stats were quite uninteresting, nothing to write home about. Then again, I did like the fact that they said the DM should consider the Almiraj an option for Wizard familiar. Awesome! And I remember that most familiars (cats, badgers, ravens) are ordinary un-interesting animals. Although a few Familiar creatures really do stand out: Pseudogragon, Tressym, Quasit, Imp, etc. Acererak ranks up as a CR 23 monster, which rates him at the level of 5E's other Demon Lords (Rage of Demons etc), etc. I thought Ras Nsi was under-statted being only a CR 7 monster. He is after all a "cover art villain" (he appears on the cover of several ToA products, like the D&D minis, etc) for this campaign, and Ras Nsi is more likely to be encountered and fight the PCs than Acererak (who may not even present himself to the PCs). Given his genocidal history of the great evils he has done, Ras Nsi should be stronger with higher stats. I'd say at least a CR 10 creature. In any case, minor stat/challenge discrepancies don't ruin this for me. As a DM, I could easily make Ras Nsi a higher CR boss monster if it makes it a better challenge for the PCs. I could also re-instate a minor Almiraj ability like the previous editions, maybe giving the creature a minor teleport ability similar to blink dogs or displacer beasts. But I'll go bug Jeremy Crawford first, they do sometimes change their minds and make some minor rules changes (in the form of Official Errata) based on player feedback. Ixalan is already released a few days ago. They've been working on it for months, probably at the same time that Tomb of Annihilation was in production. And did you notice one thing in common? Both Ixalan and Tomb of Annihiation feature the "feathered dinosaurs", which is the modern re-imagining of Jurassic lizards. I'm talking about feathered Tyrannosaurs, feathered velociraptors. About 20+ years ago, the Hollywood/fiction trope was that those nasty carnivorous dinos were ferocious sleek lizard-like predators (as portrayed in Jurassic Park). But more recent discoveries by archaeologists have supported that T-Rex likely had (some) feathers! 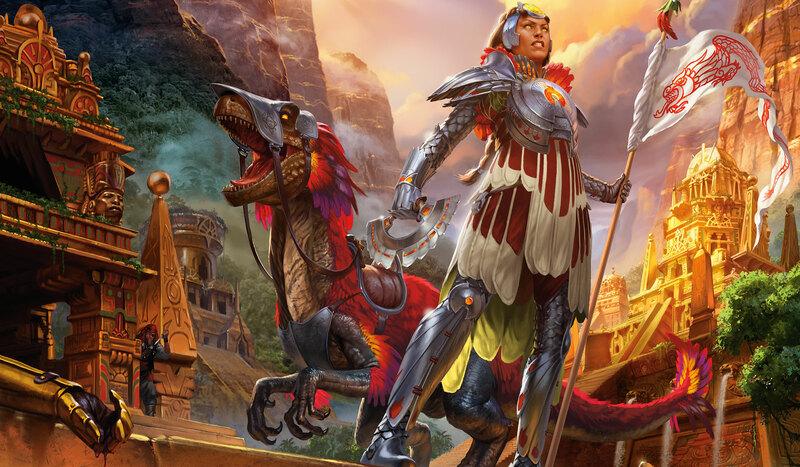 Both Ixalan and Tomb of Annihilation feature feathered dinos. I'm thinking this AP/setting need a city of intelligent gorillas. Every setting has a city of intelligent gorillas (I believe the Conan/Kull ones were even shapeshifters). I am sure Richard Lee Bryers would give that his stamp of approval. I thought Ras Nsi was under-statted being only a CR 7 monster. He is after all a "cover art villain" (he appears on the cover of several ToA products, like the D&D minis, etc) for this campaign, and Ras Nsi is more likely to be encountered and fight the PCs than Acererak (who may not even present himself to the PCs). Given his genocidal history of the great evils he has done, Ras Nsi should be stronger with higher stats. I'd say at least a CR 10 creature. Was that the same guy that was the antagonist in the Ring of Winter? Yeah, CR7 is way too low for a dude who's been around a thousand years... he may even be older than Elminster. I dunno... Ras Nsi's power comes from Ubtao, and unless they change him for the book, it's all he can do. Yes, he's been around for half of forever, and he's got the literal undead hordes -- but that's it. He isn't a high-level necromancer or anything else -- just a guy who uses a divine ability to raise the dead. He's had that one ability for years, and it's all he's needed -- so he didn't develop anything else. You take away his one ability, and he's got nothing. It's like a general in an army. The general has a lot of power because of his position -- but he himself may not be all that. Well, in a minor defense of the ToA campaign, they do give a reason as to why Ras Nsi is "weak"�..
�.it's because he's cursed by his ally-of-convenience Acererak. The curse is akin to a progressively necrotic/debilitating disease. And dumb Ras Nsi doesn't know that it's Acererak that is responsible for his curse! But part of the campaign is that the PCs will discover this, and can attempt to use this information to turn Ras Nsi against Acererak. Well then, that makes some sense, but its an awfully convenient McGuffin to nerf a major character in Chult. It also seems kind of weird Ubtao allows this to go on, but then again, Ubtao is more of a non-entity, most of the time. I would think age alone (after a millennia) would make you a canny adversary, even without any powers. His wisdom should be around 25 (IMG, I have I have it where wisdom increase with each century of life, so most humans don't really get to enjoy this phenomena). It also helps explains why the more ancient a chromatic dragon is, the less-likely it is (usually) to just act impulsively and 'attack on sight' - you can actually make deals with older chromatics. But of course, unless we have some VERY old dinosaurs, I've gone a bit off-topic. To be one of Ubtao's barae requires only two things: an above-average Wisdom and an open slot among the barae. That's it. It's nothing special... Artus Cimber could have had that position, if he wanted it, and he wasn't a local or a follower of Ubtao. Nsi has had his ability to make a literal undead army for most of his existence... Even the most powerful necromancer can't raise undead the way Nsi does. The locals aren't a threat to him; he's a bara of their deity, and even if they felt like going against him, he's surrounded by undead. Non-locals aren't going to be a threat to him, also because of that army of the undead. And with his control over the undead, there is no need for him to directly involve himself in anything... So while I would agree that simple age would raise his Wisdom score, I would also say that he's had no need to do anything that would increase his XP, and thus he's stayed at a low level. You don't need high levels when you've got enough minions to deal with all of your problems. Its more of an adventure module. However, it does give a modest amount of update to Chult. So, one of the things I'm noting. The nine trickster gods of Omu. They "possess" a host, but they can basically only "ride them" and subtly "influence them". They share the person's experiences. While they "ride" you, you gain certain special abilities that are related to that being. Sounds almost exactly like Vestiges, except for the part where they can only "possess" someone who comes into contact with something inside of this dungeon. That being said, I would expand the ability that "binders" have to include not just beings trapped where vestiges go, but also spirits in the world, and these are definitely primal spirits. In my variation of warlocks that are called "spirit shamans" and my other variation called "occultist binders" (in the complete red book of spell strategy) these would make excellent entities that can be now called canon spirits to be bound for certain abilities (for instance, I'jin the al'miraj would make an excellent spirit that you call upon to increase your dexterity) and it also gives you an idea of their personalities. Throw in here some other interesting "facts" regarding this new Omu culture and this adventure. In 3e, Acererak was a vestige as well (so prior to 1386 at least)... not sure if he was ever mentioned in 4e. putting some spoiler space. It won't really ruin the adventure, but some may not want to know the history. So, let's call that roughly the 1289'ish timeframe with maybe an additional couple decades tagged on. For nine decades, the city folk, the city folk lived by the mantras of their trickster gods. So, now we're talking possibly around ~1379 - ish.... so just around the time of the spellplague. A little over a century ago, Acererak entered Omu and slew all nine trickster gods. He then enslaved the Omuans and forced them to carve out a tombfor their defeated gods. When the tomb was complete, Acererak murdered the Omuans and sealed them in the tomb with their false gods. So, why did I point all that out? By my looks, something with the spellplague freed Acererak from "the place where vestiges go". He then setup this place as a means to gather soul energy. Ostensibly he's doing it to feed some atropal entity. So, he's "growing an undead god body". For that matter, what is this atropal? 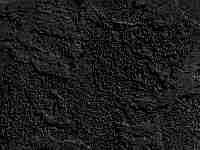 We know that Tenebrous was ALSO a vestige... and he was like an undead god as well.... could the atropal actually be Tenebrous escaped from the place where vestiges were? Then let's just throw another interesting fact on the fire. Amon was ALSO a vestige who sounded a LOT like Amaunator.... and he ALSO appeared right after the spellplague. Okay, I just flipped thru this book for the first time... I withdraw everything I'd said about Ras Nsi. I was describing the guy from the novel The Ring of Winter -- not the yuan-ti. Yeah, I read how he lost his powers from Ubtao and became a yuan-ti, but I think that was a clumsy way of forcing old lore into a new mold. If I'd written the book, in addition to respinning Acererak, I'd've used that yuan-ti baddie -- but given him an entirely different name and backstory. It would have been easier and less jarring than breaking old lore like that. They did the same with the Ring of Winter by saying it's a CE intelligent artifact, when it was previously explicitly statted up as something to be used for good. From page 144 of the Heroes' Lorebook: "Another limitation is that the Ring can only serve the powers of good. Any attempt to use it for an evil purpose results in the attempt backfiring on the wielder, much like a poorly worded wish." So basically they just took the name and dash of backstory and tacked it onto a whole new character. Gotcha. IIRC, Amaunator was 'on the rise' again just before the Spellplague hit. Of course, if you still wanted to keep that premise, all you'd have to say is that certain priests of Lathander received 'visions' of a return of Amaunator, 'the true sun-god', and thus got the ball rolling ahead of time. There is still some sort of connection there between the two deities, but its gotten weirder, if anything, now that BOTH are around. Officially, it's the same character. But if they'd called him something else and not gone with that backstory, then there wouldn't have been anything to connect the old Ras Nsi to the new one. I'm willing to bet (admittedly, with no evidence to back it up) that someone thought up the yuan-ti necromancer as an entirely separate individual, and then someone else decided to use Ras Nsi, just to have a connection to older material, and forced the two together. Yeah, I'm kind of getting a vibe of "the door to the prison was thrown open to save an individual" and instead several prisoners escaped as a result. Now, as you say, we have both Lathander AND Amaunator... and Ra... and Tezca... and possibly several others. Then again, we're also seeing possibly Tezca, and Imix, and Kossuth, and Bazim-Gorag as fire entities..... and Bazim-Gorag was also freed JUST around the spellplague as well. As always, the question is who is who, or are they all separate? The answer, not sure, and create confusion in order to make it believable, because mortals should be confused.